Providing passenger-centered solutions to improve public transportation involvements and real-time fleet management and monitoring software allows TSO Mobile to assist its clients in making sure their customers are happy ones. Customer benefits of systems in use are generated due to an efficient running and maintenance of the service. As it is becoming more and more important for many of our clients providing public transportation options to meet the needs of their passengers due to a rise in desire for effective means of transportation, it remains just as important for TSO Mobile to create superior customer service to the clients working so hard to run these services. It is important for customers know and feel that representatives of the company are knowledgeable of company characteristics and are able to respond efficiently. 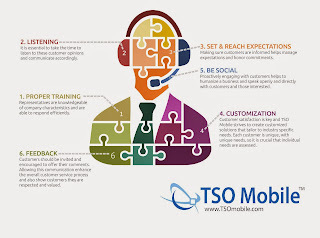 TSO Mobile is recognized as an industry leader and as such, maintains quality customer service traits in order to satisfy the needs of its clients with their experienced software development team. Customer questions and concerns demand notice by an organization. It is essential to take the time to listen to these customer opinions and communicate accordingly. In order to properly satisfy the needs of the customer, interest and value need to be shown to their opinions so that a proper understanding of needs and solutions can then be generated. Clients have expectations of companies they engage with, just like service providing companies hold expectations of their clients. Organizations need to be aware of what is expected and how to achieve expectations. Making sure customers are informed helps manage expectations and honor commitments. A sense of clarity needs to be established in order for each party to know what is expected out of the other. Customer satisfaction is key and TSO Mobile strives to create customized solutions that tailor to industry specific needs. Their software development team then implements these. Customers need to know that they are important to a company through positive relationships and communications. Each customer is unique, with unique needs, so it is crucial individual needs are assessed. Social media has made communication easier than ever. Announcements can be made and responded to instantaneously. Organizations must take advantage of these social networks. Proactively engaging with customers helps to humanize a business and speak openly and directly with customers and those interested. This is how an organization can improve services, as there is always room for improvement. Customers should be invited and encouraged to offer their comments and suggestions for business developments. Allowing this communication will not only enhance the overall customer service process, but will also show customers they are respected and valued.